Petechiae are round, pinpoint spots that appear on the surface of the skin due to minor or major health conditions. These spots are a result of breaking of blood vessels known as capillaries which cause blood to leak into the skin. 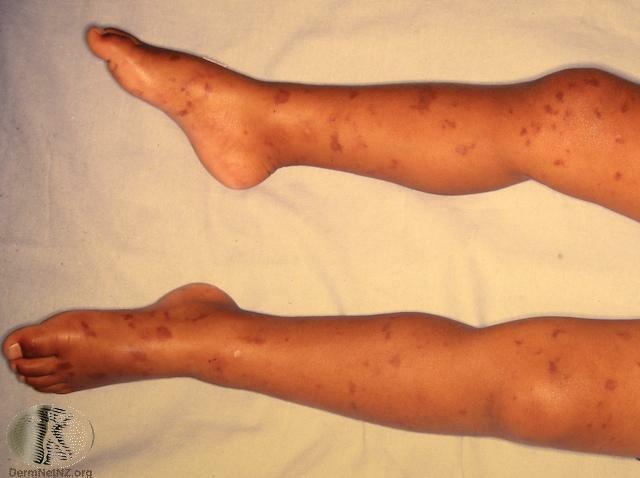 Petechiae often occur in clusters; hence people also refer to them as petechial rashes. However, they are not rashes but spots that occur due to bleeding under the skin. The difference lies in the fact that petechiae are flat to touch and do not lose color on application of pressure on, them, while a rash loses color under the same circumstances and they feel uneven. Location: They can appear in any part of the body. However, they commonly occur on the face, back, thighs, ankles, shoulders and neck. Color: The spots are red in the initial stage, but they change color They then turn purplish or bluish, and at the end, the color becomes dark purple or blue. Size: Its size is not more than 3mm and they measure from 0.5 to 1mm in diameter. 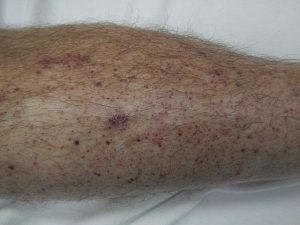 Petechiae that measure more than 3mm are called purpura. Fading: Applying pressure does not cause petechiae to lose color; this is what differentiates them from rashes. Straining: Prolonged straining due to activities such as coughing, weight lifting, childbirth, vomiting, crying, etc. may result in the appearance of tiny petechiae on the neck, face and chest. Such conditions are a result of the excessive pressure that causes the breaking of the capillaries. Medication: Certain medications react on the body in a way that causes spots to appear on the skin. Medicines like anticoagulants, chloral hydrate, naproxen, quinine, nitrofurantoin, penicillin, desipramine, indomethacin, carbamazepine, atropine, etc. There is also a high possibility of petechiae occurring in people who may be allergic to some medicines. 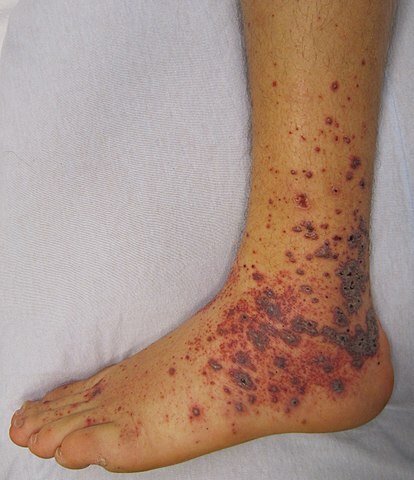 Infectious Diseases: Viral, bacterial or fungal infections can also result in petechiae. Such diseases include strep throat, viral hemorrhagic fever, scarlet fever, cytomegalovirus infection, meningococcemia, mononucleosis, Hantavirus pulmonary syndrome; Rocky Mountain spotted fever, sepsis, etc. Sunburn and Injuries: Individuals who sustain injuries after a crash or accident may develop petechiae. Similar spots may also appear on the face and eyes in case of child abuse or other physical abuse that includes smothering, biting, spanking, strangulation, etc. Similar reactions on the skin can also occur in case of severe sunburn. Vasculitis: It refers to a condition in which causes the walls of the blood to thicken, thus reducing the passage of blood flow and increasing pressure within the vessels. This pressure could result in the damage of these vessels and leakage of blood under the skin. Thrombocytopenia: In this condition, the body produces less blood platelet. These platelets colorless and are responsible for the clotting of blood. A decrease in the platelets will not allow the formation of plugs or clots that stop the bleeding from blood vessel injuries. This condition may further lead to petechiae. Leukemia: A type of cancer, the blood-forming tissues that decrease the body’s ability to fight infections. Less blood in the body may cause a strain and diseases can affect the system quickly. Deficiency: Vitamin K is vital for the formation of blood clots wherein a lack of this vitamin may cause petechiae. Scurvy is a disease that develops due to a deficiency of vitamin C. Absence of this vitamin in adequate amounts may lead to weakness, fatigue, rash, bleeding, bruising, etc. that are in close association with petechiae. Do not share personal items like glasses, utensils, towels, etc. Antibiotics: Doctors prescribe antibiotics to patients for whom infection leads to petechiae. The medication not only reduces the symptoms of the infection but also helps to treat the infection itself. Once, the infection is over, the visible signs of petechiae also disappear. Platelet transfusion: Low platelet count may be the cause of petechiae in some cases. Platelet transfusion will help to increase the platelet count in the system, thus rectifying the problem of the appearance of the red spots on the skin. Withdrawal: Certain medications have an allergic reaction towards the body leading to the development of petechiae. 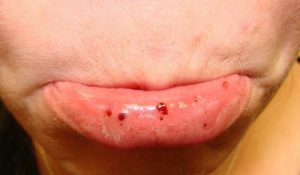 If the individual or the doctor can identify the medication that is causing this reaction, then it is best to discontinue the use of that medication. A doctor’s suggestion is imperative in such a case so that he/she can suggest an alternative medicine. Cold compress: Use of cold compress in the area that has visible signs of injury to blood capillaries can help to treat the condition. Ice will help to recover from the damage and make the red spots disappear. Caution must be taken to place a cloth between the ice and the skin to avoid causing damage to the skin due to direct contact.